Apparently yesterday was Blue Monday, supposedly the most miserable day of the year. Based on a not-very-scientific-looking formula that takes into account weather, debt, breaking New Year’s resolutions and the fact that next Christmas is aaaages away, we were all supposed to sink into a pit of existential doom. Admittedly, it was a bit cold and rainy outside and the remains of the Quality Street were impinging somewhat on my healthier eating plans but all in all, it wasn’t so bad. One of my favourite blogs is Mrs Portly’s Kitchen. If you haven’t come across it before, do check it out for a wealth of local, seasonal and also more exotic recipes. I do, however, have one criticism of its author, Linda, and that is her point-blank refusal to cook and write about Stargazy Pie. For those unfamiliar with the dish, it’s a Cornish speciality, renowned for the fact that the heads of the baked pilchards poke out through the pastry. You can see photos of it here, as well as read about the legend of heroic fisherman Tom Bawcock, who is said to have inspired the dish. Taste is a funny old thing. It’s easy to assume that if you love something with a passion that everyone else does too. But, of course, it doesn’t work that way. Children are a prime example: you think that your children are inestimably clever and funny but the person sitting next to you on the train for two hours thinks they are badly-behaved and precocious. And so it seems to be with blue cheese. I adore it and my fridge is never without a hunk. We consume kilos of the stuff and even the precocious children like it. So this month it was a shock to discover that lots of people don’t like blue cheese. Not only were there less recipes than usual but many people prefaced their blog post with ‘I don’t like blue cheese but…’ Nevertheless, several people gamely overcame their prejudices to cook up something lovely. This week’s cheese was a very lucky find. With Friday approaching and a fromage-less fridge, I braved the cheese counter at my local supermarket to see if I could find anything of interest. Apart from the usual continental suspects and a handful of decent territorials, there is usually very little to be found there, unless you like your cheese soused in some dodgy booze flavouring or tasting of jalfrezi (and sorry if it makes me a cheese snob of the worst kind but I just don’t). My heart was beating with fear and trepidation at the sight of all the shrink-wrapping when I noticed this week’s cheese nestling against the glass. 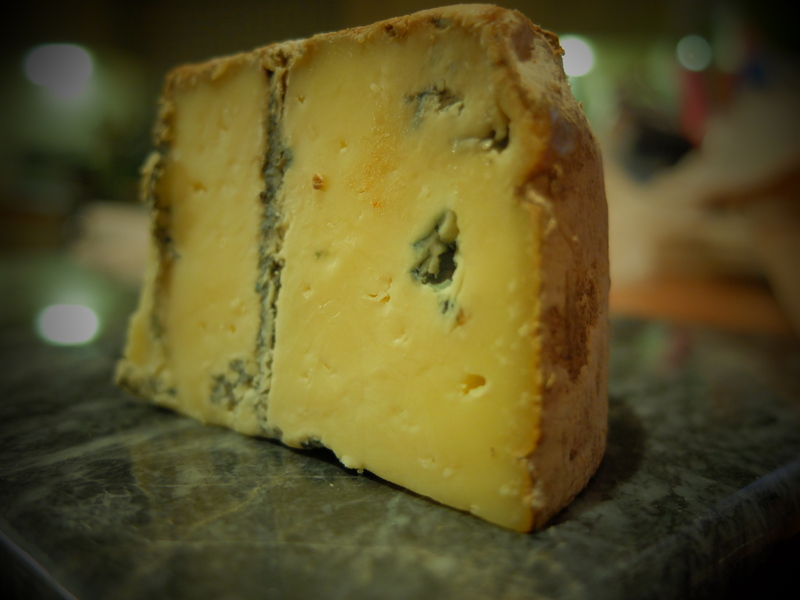 I’d heard good things about Cornish Blue so snapped some up sharpish (much to the annoyance of the deli lady who was obviously in a big huff about the fact she had to cut into its virgin rind). But the big question was: what’s an artisan cheese like you doing in a joint like this?